If you’ve had trouble caused by squirrels getting into your “squirrel proof” bird feeder, this is the bird feeder for you. The Droll Yankees Flipper Squirrel-Proof Bird Feeder is one of the best squirrel proof bird feeders I’ve found. Made by Droll Yankees, this squirrel proof bird feeder has a perch that spins the moment a hungry squirrel steps onto it. When birds land on it, however, nothing happens. The spinning actions requires the heavier weight of a squirrel before it will activate and spin causing the squirrel to fall from the bird feeder. It operates by means of a rechargeable battery built into the base of the feeder. The seed tube is large and able to hold a lot of bird seed. It’s also made of a clear plastic that won’t fade or discolor after being in the sun for a long time. The tube itself is tall to ensure that squirrels can’t reach the seed ports by hanging upside down from the top of the feeder. Comes with a lifetime guarantee against squirrel damage and a one year guarantee against any failure of its electronic components. Pros: Lots of birds. This feeder attracts many different species of birds including Cardinals, Chickadees, Finches, Flickers, Goldfinches, Grackles, Grosbeaks, Jays, Juncos, Nuthatches, Redpolls, Siskins, Sparrows, Starlings, Titmice, Towhees, Woodpeckers and Wrens. Quality entertainment. You may just get more fun from watching the squirrels get spun like a merry-go-round on this feeder than from seeing the birds that feed from it. Long lasting battery charge. The battery needs to be charged only about two or three times a year, more if you have lots of squirrels frequently activating the spinning perch. Cons: When the squirrels jump onto the perch of the Yankee Flipper, get spun and tossed off, bird seed spills onto the ground where the squirrels are able to eat it. Watch the video again and take note of the bird seed that spills when the squirrel jumps onto the feeder. The manufacturer addresses this issue by stating that the overall concept is “that it is preferable to prevent the squirrels from monopolizing the feeder, rather than only attempting to block their access to the seed.” And, as I recommend on this site, if you set up a squirrel feeder elsewhere in your yard, the squirrels will learn that it’s much easier to eat from the squirrel feeder than to be spun and tossed from the Droll Yankees YF Flipper 4-Port Hanging Bird Feeder . Over a period of a few years the battery tends to not hold a charge as long as it did when it was new, however you can purchase replacement batteries. Summary I highly recommend this bird feeder. 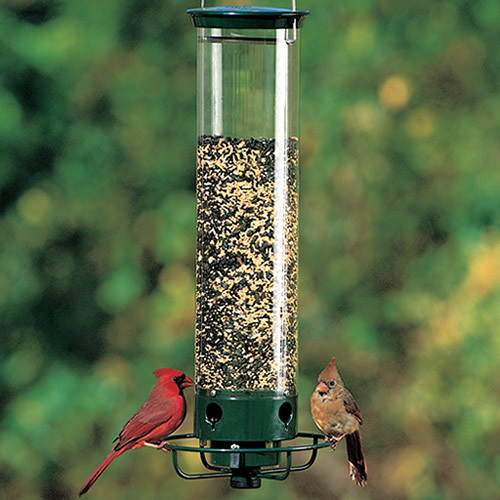 It’s one of the best squirrel proof feeders on the market. Click on the picture for price and availability learn more.